Busch Garden's Drops BIG News! Busch Garden&apos;s Drops BIG News! Busch Gardens Tampa Bay has been teasing the media for months letting us know they were going to “drop BIG news” and today the secret was finally revealed. Lucky for you, I was sitting front row and I am excited to share all the details! We can all agree that for more than five decades Busch Gardens Tampa Bay has delivered some of the world’s most exciting, hair-raising, adrenaline attractions with rides like Chettah Hunt, SheiKra, Montu and Kumba. 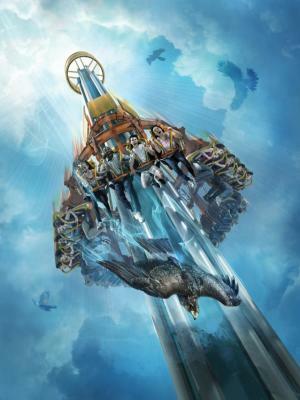 In Spring 2014 Busch Gardens is taking guests’ experiences to new heights with Falcon’s Fury, the FIRST drop tower of its kind in the world! That’s right I said drop tower… did your heart just drop a little, because I am a mixture of excited and queasy. Falcon’s Fury will stand at 335 feet and like its bird of prey namesake, riders will pivot 90 degrees in midair to face-down dive position. An instant later they’ll plunge 60 mph at 3.5 Gs straight down with speed and power. Construction for the new attraction has already begun, and Falcon’s Fury is scheduled for completion in spring 2014. Stay updated about the progress of Falcon’s Fury at Busch Gardens by going to FalconsFury.com or drop in to BuschGardensTampaBlog.com. Tweet us your thoughts @VisitTampaBay and @BuschGardens using #FalconsFury. Stay tuned for more ways to discover your daring in Tampa Bay!